One effective small space solution is to use small scale furnishings. Choose furniture that is scaled to your space. 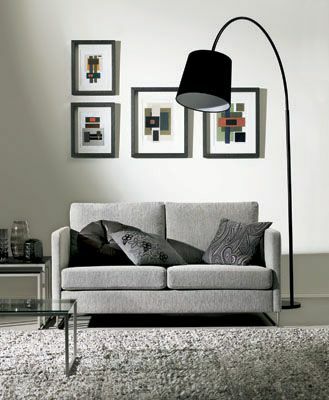 The Indivi 2 sofa from BoConcept has a small, sleek profile, and therefore gives the room more breathing space. Indivi 2 is available from BoConcept in different fabrics and leathers. Pictured here in light gray Icon fabric. Dimensions H30"xW56"xD36". Priced from $1,049. Having hidden storage is one of the solutions to having a small space. It is a good idea to prioritize and you may want to use closets space for clothing or items that you need to access all the time. This Storage Bed from BoConcept provides plenty of space for storing bedding, clothing or anything else that you need to store. The raisable bed frame provides easy to access your things. BoConcept's Storage Bed with raisable frame and slats. Base available in white lacquer, black-stained oak ​and walnut. Available in Queen and King sizes from $1,649. Investing in multifunctional furniture is one of the smartest ways to furnish a small space. Hiding clutter is very important as unattended clutter can make space seem smaller. The Functional Coffee Table allows you to store small objects such as books or remote controls. The separate table tops lift up to provide flat, raised and stable surfaces for dining or working. Available from BoConcept, Functional Table comes in white lacquer, walnut, black-stained oak, and wenge veneer. Dimensions:13"H x 44 3/4"W x 31 1/2"D. From $1,099. Using reflective or non-opaque surfaces lets your furniture hide. Glass and metal reflect their surroundings, while glass also lets you see through the object which reduces its visual weight. These tables also have the advantage of being mobile, so you can move them around your space as needed. BoConcept's Mobile Side Table (left) in glass and chrome. From $299. Mobile Cocktail Table in glass, black lacquer, and chrome. From $479. Using room dividers is an effective way of delineating areas. While they don't take up a whole lot of valuable floor space, they provide extra room for storing books and office supplies or displaying accessories. The Amari room divider from BoConcept can also serve as a bookcase, makeshift office or a place to dine. Available in black-stained oak and white lacquer. Dimensions: 41 1/2"Hx67"Wx18 3/4"D. From $1,499. To accommodate guests, look for flexible solutions for sleeping, such as a sofa bed . BoConcept has dual-purpose furniture like sofa beds and sofas with built in storage to optimize limited space. The Spaze sofa featured here offers built in storage as well housing a bed. This sofa comes in many different fabrics and leathers, and is shown here in black Contra fabric. Dimensions:34 3/4"H x 109 1/4"W x 59 1/4"/90 1/4"D. From $4,199. For a sleeping solution on an even smaller scale, you can try an ottoman that unfolds into a guest cot. In its unfolded state it can serve as a seating option or a surface that serves as a table. When you lift off the cover of the Xtra Ottoman, it unfolds to reveal a compact and well-cushioned guest cot with mid-section support Available from BoConcept in 73 fabrics. Mattress made of 33kg PUR foam polyurethane. 16 3/4"H x 27 3/4"W. Expands to 78"D x 27 3/4"W. From $499.